This is what Reese does whenever he has the chance. 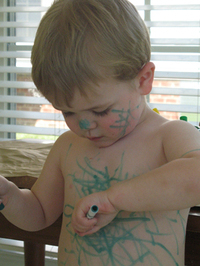 In this photo, he is using washable marker. Oddly, I actually prefer it when he uses permanent ballpoint pen, since the washable marker smears off of his hands onto everything else in the house. Sure, it's washable, but I'd rather not wash EVERYTHING he touches. In semi-related news, a friend of mine is in the process of getting a full-back tattoo of a phalaenopsis orchid, from roots to flowers. It's amazing. Her bravery has me seriously reconsidering whether or not I would ever get ink done, and what art I would choose - probably a gryphon or a sunshine, but I have never seen one that made me say "THAT is the one I want permanently inked onto my body." Lynz recommends sharpie. ;) I'm also considering a little blue hair. When I got my hair chopped I mentioned that to Melissa and she seemed to like the idea. Hmmm, maybe something for summer?